Over 70 years of scientific research shows that drinking optimally fluoridated water prevents approximately 25 percent of cavities. This is in addition to fluoridated toothpaste, mouthwash and other sources of fluoride. Fluoride is an important mineral for everyone. Bacteria in the mouth combines with sugars that produce acid that can harm tooth enamel and damage teeth. Fluoride protects teeth from acid damage and can help stop or reverse early signs of decay. Most water does not have enough of this fluoride nutrient. Through adding a small amount to the water, tooth surfaces are made stronger and more resistant to decay. People of all ages have benefited from this addition of the fluoride mineral through drinking fluoridated water and brushing with fluoride toothpaste. Pediatricians, dentists and health professionals have seen a dramatic decline in the severity of tooth decay over the last seventy years. To find out how much fluoride is in your water check the charts below. Congratulations from Bureau of Oral Health! The Bureau of Oral Health awarded 20 Kansas Water Systems the Kansas Water Fluoridation Quality Achievement Award. These systems were recognized for their dedication to consistently and professionally adjust the water fluoride content level in 2015 according to CDC recommendations. 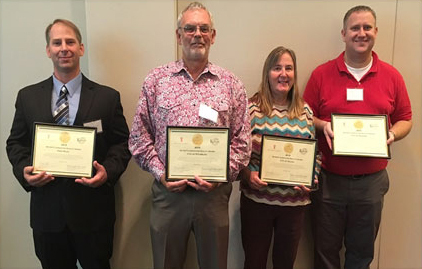 In attendance for the awards ceremony at the Oral Health Kansas Conference in November were: Steve Stanislow - Fort Riley, Stephen Gillis - City of Pittsburg, Martha Tasker - City of Salina, and John Gilroy - City of Olathe. KS Water Systems awarded: Ellsworth County RWD 1, Fort Riley, Cities of: Garden City, Gardner, Garnett, Lincoln, Maize, Manhattan, Marion, Olathe, Osage City, Ottawa, Pittsburg, Salina, Topeka, Wellington, K.C. Board of Public Utilities, Marais Des Cygnes Public Utility Authority, Public Wholesale WSD 4 and Public Wholesale WSD 5. What is Kansas RANKED in the region? Almost 1.7 million Kansans receive fluoridated water, but Kansas still falls behind in our region for the percentage of residents that receive water from fluoridated public water systems. Missouri, Nebraska, Colorado and Iowa all provide a higher percentage of their citizens with fluoridated water that can help strengthen teeth and prevent cavities. To read more, click here.